The records of a HOA are broken into two (2) categories: “association records” (Civ. Code § 5200(a)) and “enhanced association records” (Civ. Code § 5200(b)). “Association records” include such items as annual budget reports and financial statements, income tax filings, board meeting minutes (except for executive session minutes), and executed contracts. “Enhanced association records” include such items as invoices, canceled checks, purchase orders, credit card statements, and reimbursement requests submitted to the HOA. However, not all documentation that the HOA may have constitutes a “record” that is subject to inspection by a member. As discussed below, there are many “records” that an Association may have that is not subject to inspection by a member, or that may be reasonably withheld from the member. Many HOA documents contain sensitive, confidential or privileged information. While such documents may fall within the purview of an “association record” or an “enhanced association record,” such records may nevertheless be withheld or redacted to the extent that they contain sensitive, confidential or privileged information. Civil Code Section 5215 therefore allows a HOA to “withhold or redact information from the association records” under various circumstances. Those circumstances include, but are not limited to, situations where the record contains information reasonably likely to lead to fraud, identity theft or to compromise the privacy of an individual member. Other documents that may be withheld or redacted include items such as records of disciplinary actions or assessment collection activities, or information privileged under law (e.g., opinions and invoices from the Association’s legal counsel; see Smith v. Laguna Sur Villas Community Assn. (2000) 79 Cal.App.4th 639, 645-646). Additionally, a member’s right to inspect records does not necessarily require the HOA to compile information on the member’s behalf. For example, a member may not request to have the HOA’s management compile a list of all common area violations for any particular time frame if the HOA has not previously created such a list. The process for requesting copies or inspecting records, the costs associated with the request, as well as the timing for producing the requested records, is governed by Civil Code Sections 5205 and 5210. Upon a member’s request to inspect association records, the HOA is required to produce the records (absent justification for withholding the same), within a specific timeframe at the HOA business office within the development. If the HOA does not have a business office within the development, the requesting party and the HOA may agree on an alternate location. If no agreement can be reached, the HOA may meet its requirement to produce association records by individual delivery (i.e., by sending the records to the member via first-class mail or by electronic means). Civ. Code § 5205(c);(d). A member may specifically request to have the records sent by electronic transmission so long as those records can be transmitted in a redacted format that prevents the records from being altered. Civ. Code § 5205(h). The time period for producing association records varies depending on the records requested. 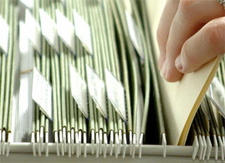 For example, the HOA must make current fiscal year records available for inspection within ten (10) business days of the receipt of the request, while a request to inspect meeting minutes or records relating to the previous two (2) fiscal years must be made available for inspection within thirty (30) business days. Civ. Code §§ 4950, 5210(b)(1)-(2). Also, minutes from a meeting of a HOA committee that has decision-making authority (i.e. an Architectural Committee) must be made available for inspection within fifteen (15) days following approval. Civ. Code § 5210(b)(5). However, a request for association records more than three (3) years from the date of the request need not be honored. Civ. Code § 5210(a)(1). The same cannot be said for minutes of member and board meetings. Such records are “permanently subject to inspection.” Civ. Code § 5210(a)(2). Preparing association records for inspection and copying can be a costly and time consuming venture for a HOA, especially if the request is extensive. Thus, notwithstanding a HOA’s obligation to make available certain records for inspection and copying, the HOA may bill the requesting member for all “direct and actual costs of copying and mailing” the documents. Civ. Code § 5205(f). Moreover, the HOA may also bill the requesting member ten dollars ($10.00) per hour (not to exceed two-hundred-dollars ($200)) for the time spent preparing (i.e, redacting) enhanced association records. The HOA member is required to agree to pay those estimated costs before the HOA is obligated to retrieve the requested records. Civ. Code § 5205(g). The above requirements generally do not apply in instances where a director (a HOA board member) is seeking to inspect and copy “association records” and/or “enhanced association records.” Corporations Code Section 8334 gives each director “the absolute right at any reasonable time to inspect and copy all books, records and documents of every kind and to inspect the physical properties of the corporation of which such person is a Director.” Thus, unlike regular members of a HOA, directors (1) are not subject to the requirements of Civil Code Section 5205 (i.e., do not have to pay for the costs in producing records), and (2) have broader record-inspection rights than members (i.e., can inspect executive session minutes). A HOA should note that these rights reserved for directors are limited in certain circumstances. For example, a prior director loses his/her broader record-inspection rights once the prior director is no longer serving on the board, notwithstanding whether the desired records pertain to a decision or action of the prior director or of the board while the director was on the board. Wolf v. CDS Devco (2010) 185 Cal.App.4th 903, 908. Additionally, the HOA can decline to permit a current director to inspect certain association records if the HOA can demonstrate that the director is seeking to do so to advance his/her personal interests against those of the HOA. Tritek Telecom, Inc. v. Sup. Ct. (2009) 169 Cal.App.4th 1385, 1391 (a director “cannot take off his ‘shareholder’s hat’ and swap it for his ‘director’s hat’ and claim an absolute right to access all corporate documents”). HOA boards and management professionals should be cognizant of the restrictions and requirements applicable to a member’s record-inspection rights and the corresponding obligations of the HOA. It is important for a HOA to uphold those obligations, as Civil Code Section 5235 provides a member with the ability to bring an action against the HOA in small claims court to enforce the member’s record-inspection rights, and further subjects the HOA to potential penalties of up to $500 for the unreasonable denial of each separate records request. However, it is also important to protect against the wrongful disclosure of sensitive, confidential or privileged information–including information which may be prejudicial to the HOA in an ongoing legal dispute and/or expose the HOA to liability. Therefore, in circumstances where a HOA’s obligation to produce certain records is unclear, the HOA should consult with its legal counsel to determine the appropriate course of action in response to the member’s records request. The information above can be obtained in our article entitled “Inspection and Copying of Association Records” that is available for download from our Web site’s library.